In 2003, a friend in the new energy field told me that his introduction to paranormal phenomena was watching UFOs with James Gilliland near Mount Adams in Washington State. In early 2004, a friend who works at Boeing suggested that we go watch UFOs at James Gilliland’s ranch. In June 2005, I finally went there to see for myself. I had never seen a UFO and had never tried. I know many people who claimed to have seen UFOs, and seeing one had long been on my list of things to do. When my Boeing friend arranged a trip to Gilliland’s ranch, I was ready to go. James Gilliland’s Web site is here. We met James at his ranch on June 4th, 2005. He was the perfect host, spending several hours talking with us and offering to let us spend the night at his ranch, which we did. James is very mild mannered, particularly when considering the wide range of intense and controversial topics that we discussed (such as the coming earth changes, political skullduggery in elite circles, close encounters with bigfeet and other creatures, free energy, etc.). 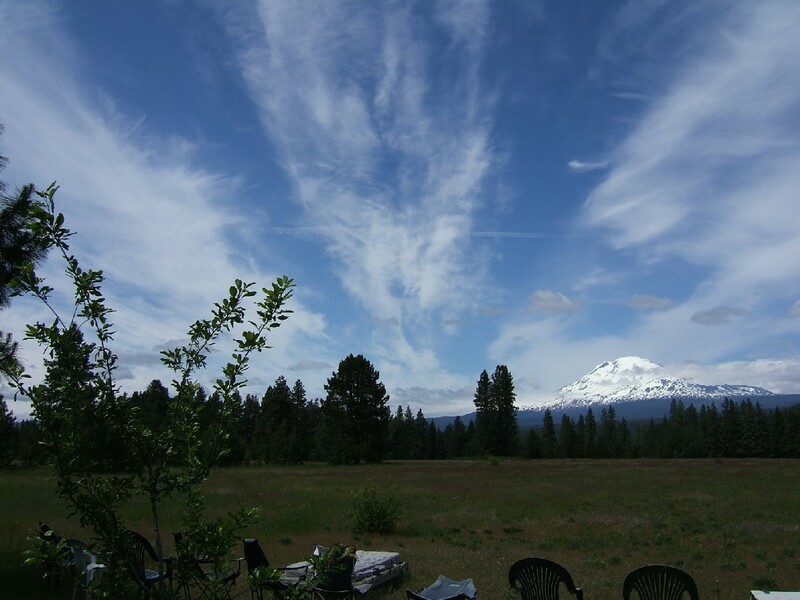 His ranch has a spectacular view of Mount Adams. The below photograph is from his “backyard,” a few yards from his house, where people gather from all over the world to watch UFOs. About 3,000 people have witnessed UFOs at James’ ranch. He has published many testimonials from visitors. James has had numerous visitors from the U.S. military, the CIA, NASA and other alphabet soup agencies. He has had Special Forces operatives visit him, as well as people who say they worked on captured extra-terrestrial (“ET”) craft, to reverse-engineer their technology. I have independently encountered that phenomenon. As is evident from the testimonials, a common incident is a UFO “powering up” and becoming very bright in the sky. No mundane phenomenon can account for it, let alone the many sightings where the craft have flown low over James’ ranch. If UFOs fly close to the ranch or land on Mount Adams, the U.S. military and related organizations can be counted on to chase or attack them, sometimes shooting exotic weapons, such as lasers and plasma weapons (which do not seem to affect the craft). Operatives from the spook world have watched those UFOs “power up” above James’ ranch, and they say that nothing “we have” can do that. While we talked with James on that Saturday afternoon, airplanes flew by in an endless procession, leaving heavy contrails that James and others call “chemtrails.” In the photograph above, all the high “cirrus” clouds are those heavy contrails left by jets. 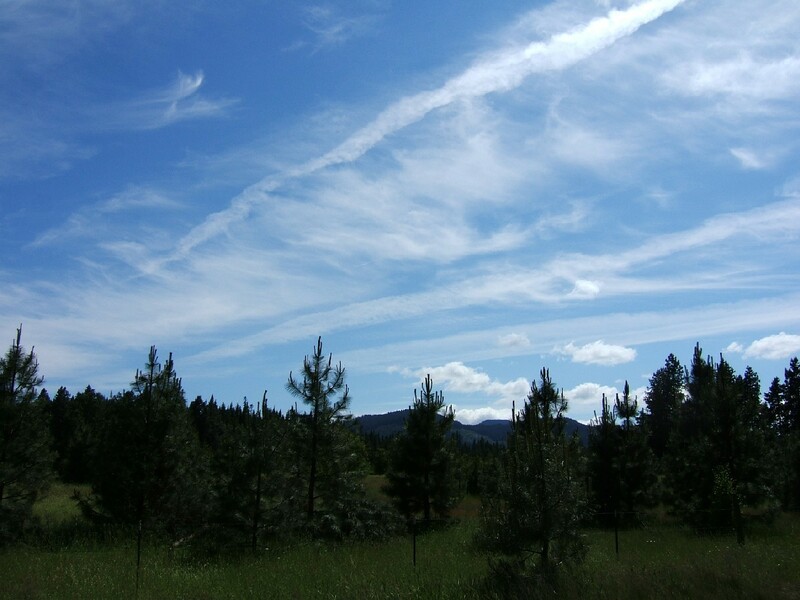 The photograph below shows those “chemtrails” in more detail. Chemtrails are controversial. Investigators have collected samples of chemtrails for analysis, which U.S. government agencies such as the EPA have refused to test. James told us that a member of U.S. Congress recently tried opening an investigation of them, and was advised by a high-ranking military official that if she valued her career and her family’s health, she should cease her investigation (which she did). If chemtrails are a genuine covert action phenomenon, I doubt the motivation behind chemtrails is benevolent. The military and related attention to the Mount Adams area likely has nothing to do with the “threat” that UFOs pose to humanity, but the “threat” that they pose to the world’s power structure. All the attacks and other games are most likely not to keep humans safe from ETs, but to keep ETs from openly interacting with humans, in alignment with the Brookings Institute’s advice to NASA many years ago. James has endured great harassment from the people trying to remove UFOs from public awareness. By that evening, the chemtrails had blown away and the sky was clear. James said that the best time for viewing UFOs was between 10:30 and 11:30 at night, or at about 5:00 in the morning. We went to dinner and arrived back at the ranch at about 10:00 PM. At 10:00 PM, Mount Adams was in twilight, and by 10:30 the sky was about as dark as it gets in the summer. There was no moon that evening. There were about fifteen people watching the sky at James’ ranch that night. We watched one satellite make about a thirty degree turn as it changed course from moving in a northwesterly direction to moving due north as it passed over Mount Adams (at least from our perspective), although satellites are hundreds of miles away in the sky. One veteran sky watcher said that normal satellites cannot make a turn like that, as he watched it make that turn. It was interesting but not spectacular. A few other anomalous “satellites” were seen that evening. At about 11:00 PM, James decided to “call” a UFO and began flashing his ten-million-candlepower spotlight into the sky. He later said that he also prayed for one to make its presence known as he flashed his spotlight. James said that they respond to heartfelt human desire to see one, and they respond best to a joyful attitude. He said that the dour, stern UFO “nuts and bolts” investigators do not have the right attitude to go UFO hunting. Somebody said that afternoon that the “permanent scowl” that UFO investigator Phil Klass wore defeated him before he even began, and that is giving Klass the benefit of the doubt that he was not working on behalf of the power structure as a UFO debunker. Within a couple of minutes after James began flashing his spotlight, it happened. One innocuous “satellite” that was passing slowly south, to the east of Mount Adams, suddenly “powered on.” For about five seconds, it was the brightest thing in the sky, by far. Think of Venus-times-ten in brightness, and you get an idea of what we saw (one of my Boeing pals called it “Mars times fifty”). It was spectacular, and nothing that could be explained by the typical “debunker” explanations. It was not “one of ours.” After about five seconds of brilliance, it powered down and became just one more “satellite” trailing across the night sky. I had seen my UFO. There was no doubt among any of us regarding what we had seen, and some were very experienced at watching satellites and other lights in the sky. One of the witnesses that night was a retired Air Force captain). Being ready to film a UFO “powering on” for a few seconds is not an easy trick, and we did not film it. However, James publishes many photographs on his Web site, and publishes DVDs with footage and photographs taken over the years. James said that the psychic abilities he has developed over the years (beginning with his near-death experience) allows him to anticipate when they appear, so he is often ready with his camera. Below is a frame from a video that James took of a UFO lighting up, which is almost exactly what we saw, sans the “Star of David” effect (the image below also links to the clip). We received a fairly typical show. Other clips can be seen at this link. In the years since our sighting and my presentation of James’s clip of an almost identical sighting, I have been amazed at how people have misrepresented what the clip depicts or why I even present it; and I have even heard from people who seemed to want to understand but did not comprehend what they were seeing. In August 2008, I added this footnote, with a diagram, to provide more context. I have directed people to James’ ranch since our 2005 sighting, and although what we saw was relatively standard, it was apparently better than average. When we returned in 2006, our 2005 sighting was remarkable enough that James recalled it, calling it a show put on by the “big ships.” Big ship displays are fairly common at James’ ranch, but ours was impressive enough that my Boeing pals talked about it with Art Bell on the Coast to Coast show the next year. One Boeing pal told me that he was in a daze during the week after seeing that UFO light up above Mount Adams. His universe of the possible greatly expanded after that experience. Many in the UFO field have called James a fraud, which is a typical situation encountered in these realms of investigation (the human ego is nearly always the culprit). James’ response has always been, “come to my ranch and see for yourself.” People do not go away disappointed, and only those who refuse to visit and see for themselves openly disparage or dismiss James’ work and what happens at his ranch. Nine of us visited James on June 2, 2006. James was once again a very gracious host. One Boeing pal brought his wife, and the rest were my friends. We had partly clear sky on June 2. As with our 2005 visit, many “satellites” crossed the sky that evening. I began developing a trained eye for observing their behavior, and several made turns while crossing the sky, which normal satellites cannot do. In the dark, in the middle of a field, if somebody said, “look there!” few could see where they were pointing. James taught us to call out coordinates, such as an object’s relationship to the Big Dipper and the compass points (i.e., north, south, east, west), so people could direct others to what they were seeing, particularly when people had to look quickly or miss the event. As with 2005, one UFO “powered up” above us, but the 2006 experience was frustrating. It again happened at about 11:00 PM. 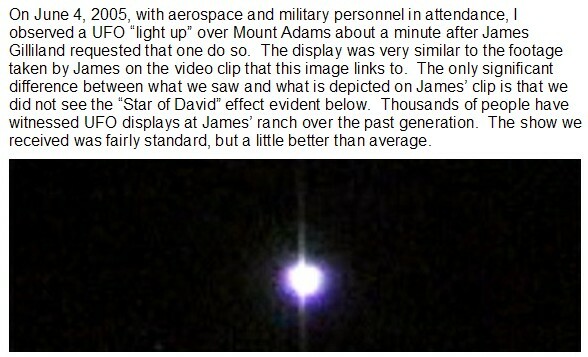 In 2005, I saw the UFO powering up and James pointed to it with his flashlight as the event began. The 2005 event stunned everybody who was there (except those who had seen such spectacles previously). In 2006, of the dozen who were watching, only James and I saw it. In our 2005 sighting, the UFO powered up to the northeast of Mount Adams, at about a thirty-degree angle to the ground. 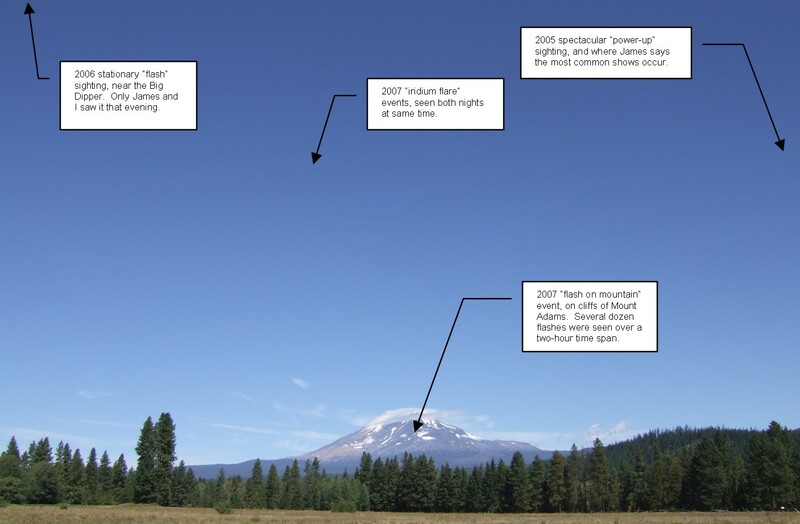 In 2006, the UFO powered up to the northwest of Mount Adams, and at about a seventy-degree angle to the ground. Neither James nor I saw it power up, but we saw it after it became bright. That night was a half moon (first quarter) in the southeast, and the brightest star was to the south (Jupiter, I believe). At about 11:00 PM, I suddenly became aware of a very bright star. This year’s UFO seemed about two-to-five times the brightness of Jupiter. It was definitely the brightest “star” in the sky, but was not moving as the 2005 UFO did; it seemed to stand still. For about two seconds, my mind pondered that star’s brightness and position (near the Big Dipper). I did not want to cry wolf for a normal star, but my mind raced as I considered if it might be a UFO. After about three seconds, I realized that no star in the sky had been that bright, particularly near the Big Dipper, and James and I called out at about the same time. About a second later, the “star” completely disappeared. James and I saw it probably a second after it had powered up; it went dark a second after we called out, and nobody else saw it. It was another five-second event. I coordinated the 2006 trip. One friend flew from California to see it, and my hesitation meant that my friends did not witness the main event. We stayed for the next night, but were rained out. One veteran sky watcher said he was convinced that more than satellites crossed the sky that night, and early in the night he saw a strange flash. Even so, I returned to Seattle with a keen sense of frustration. I dragged my friends along so they could experience the awe of watching a UFO make a display, and only I saw the big show. I wonder if my ET pals influenced that situation. James voiced the same suspicion, but also playfully joked that I was his confederate in calling out a UFO that nobody could “see” but us two. As I watched that UFO light up the sky, it felt as if I was being subtly prevented from calling out in time. That is not a product of fermented frustration, but immediately after I called out and the UFO went dark, I wondered why I had not called out sooner, even though my hesitation was no more than two seconds. I doubt I have made my last trip to James’ ranch. For 2007, I wanted to treat my friends to the show they missed in 2006, and six of us went, including one of my Boeing pals. The results were mixed, once again. We went on Labor Day weekend, watching the sky at James’ place on September 1 and 2, 2007. Afterward, I led a backpack at nearby Indian Heaven Wilderness (which was a very nice trip). It was a bit crowded at James’ place that weekend, which was typical, I suppose, for a holiday weekend. Other Boeing personnel were there that weekend, of perhaps forty people who attended over both nights, with a fair number of them sleeping in tents. The very first night, within an hour after sundown, we saw a spectacular flash by a satellite due north of us. It did not look much different than what we saw in 2005, but seconds after it happened, James’ assistant informed us that it was an iridium flare of a normal satellite. James and crew are aware of the official satellite activity by referring to heavensabove.com, and can distinguish the official activity from the non-official. 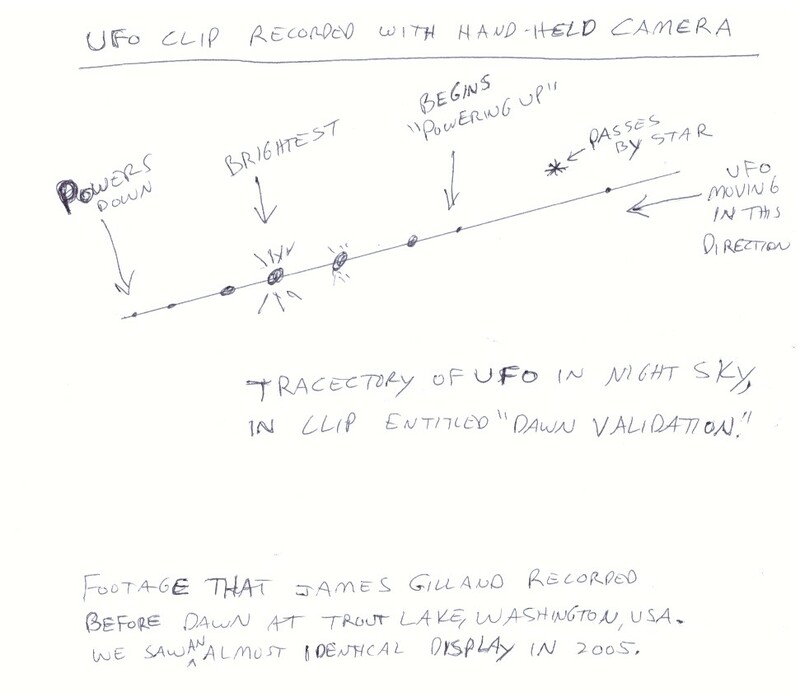 James says that the “unofficial” activity in the sky above his ranch is several times greater than the official activity. The next night, the same flare happened in the same place in the sky at the same time, right on schedule. We did not see any “unofficial” satellites “light up” for us that weekend, although we did get a show of one of the most persistent sightings at James’ ranch. There was a bright light, flashing on and off, on the cliffs of Mount Adams, for the duration of the two hours that we watched the first night. There is not supposed to be anything on the mountainside, which is all glacier and cliff, but the light did not seem to move, and flashed intermittently, quite brightly, that evening. Here is a link to a clip that James took of the flashing light of Mount Adams (see the orbs footage on his site as of September 2008, and there is some footage of the flash on the mountain). We all watched the peculiar flashes through high-powered binoculars that my Boeing pal brought. James has taken high-powered lights onto the mountainside where the flashes occur, and by using cell phones to coordinate the activity, he has tried to reproduce those flashing lights on Mount Adams. The people at James’ ranch, thirteen miles away, could not even see the light that James was flashing at them. James also has footage of military planes chasing those flashing lights. The lights easily elude the military planes, either by disappearing or flying off faster than the planes can. Technology has improved at James’ ranch since our first visit. Where James flashed a flashlight into the sky in 2005 and 2006, in 2007 they were using laser pointers - a $500 piece of equipment. It made it easy to see what they were pointing at. James pointed to where the most “power-up” activity takes place, and he pointed exactly to where we got our show in 2005. Below is a picture taken from James’ ranch, and I have added information to it, to document what I saw, in what year. The last night at James’ ranch, we did not see anything that qualified as unusual, making it the only night out of four that I have not seen something strange. All in all, I have had a show of something inexplicable by mundane explanations each year, but if I ever get a better show than the first night that I visited, that will really be something. Well meaning people have challenged the validity of what we saw. I will answer some of those questions here. People have proposed that those “satellites” “powering on” are something more mundane than UFOs responding to James’ request for them to light up. On one of James’ videos, a TV news report is produced where a scientist says that the people at the ranch are really seeing satellites and other human-launched space hardware. Nobody who has been to James’ ranch buys that explanation, and “explanations” like that detract from the armchair “skeptics’” credibility with those who investigate the paranormal. No acknowledged satellite can radically change direction and velocity, or change shape and color, or land on Mount Adams. That 2005 "power-up" display I highly doubt was some trick where James knew an "iridium flare" was about to appear, and he gulled us with acting like he could summon a "UFO." Another proposed explanation was that the spotlight that James used to “call” the UFO is what lit it up. If it was a real satellite, it was at least a hundred miles away in orbit. James’ spotlight can light up trees a few hundred yards away. There is a big difference between hundreds of yards and a hundred miles, and James was not flashing his spotlight on the UFO when it lit up. James recorded video footage at this link mentioned above, and no spotlight was involved in that sighting. Others have wondered if James was playing some kind of high tech trick on the people at his ranch. We stood out in the middle of a field many miles from the nearest city, watching the night sky, and a “satellite” became brilliantly illuminated for a few seconds, within a couple minutes of James trying to call one. You can’t fake a “satellite” suddenly becoming the brightest thing the sky. I know of no earthly technology that could accomplish that, much less doing it in a field next to a collection of modest dwellings in the middle of nowhere. At this time, I lean toward believing that the "orbs" that James and others have photographed are mundane anomalies relating to digital cameras, although he showed us numerous anomalous photographs that could not be explained as artifacts of digital photography, such as a ghost whose face was recognizable as the person who died in the home the ghost appeared in, and who was "hassling" the house's current resident. However, the orb videos on his site as of September 2008 are pretty incredible. No mundane explanations proposed for our UFO sighting have held any water so far, and when I watched James attempt to attract a UFO, and watched one “power up” a couple of minutes later, nobody will ever “explain it away” to me. Many years ago I had undeniable proof that all people are inherently psychic, and subsequently learned that a person with experience is not at the mercy of a person with a theory. James recorded that footage early one morning, before dawn, when a voice in his head woke him and told him to go outside with his video camera. He used a cheap, handheld video camera, so the footage is shaky, which is typical. Below is a diagram I made of that footage. Many have complained that it was not a Spielberg-quality clip, likening it to shaky and probably-faked Bigfoot footage. That is a fallacious argument. There is no alleged Bigfoot footage where visitors can go see the Bigfoot return each day where the footage was taken. Even if it was Spielberg-quality footage, it would not mean anything. Footage is easily faked. Debate and image analysis are meaningless when somebody can go see the show for themselves. Seeing it for one’s self is how knowledge is gained. Presenting the footage only shows people what they can see if they go see for themselves. For those who seek the truth and have doubt, they either remain quiet or go see for themselves. Disparaging the clip is a trolling tactic. Anybody sincerely seeking to witness such a show can easily achieve it at James’s ranch. In my initial inexperience with such sightings, I believed that what we saw was typical, because we saw it the first night about a minute after James tried to elicit a display from the ETs. I now know that our show was better than average, but it is not that unusual at the ranch, and there have also been far better sightings. The first three nights I tried seeing something at James’s ranch, in 2005, 2006 and 2007, I saw something with no mundane explanation, and the first experience knocked those watching it back on their heels. The Boeing pal most blown away by the first year’s sighting has returned with me each year. The only night I did not see something was the last night in 2007. That night was on Labor Day weekend, and when we showed up, a radio personality was loudly “holding court.” A person I brought from thousands of miles away immediately fled the scene as that radio personality’s ego began cranking into high gear. He yelled at passing satellites to display their “white magic,” and dominated that night in the field. I think there was too much ego there that night, and we did not see anything.